The PDS Seminar 7, “A Review of Teaching & Learning Strategies foe STEM Education” was held on Friday, 30th June 2017, from 3:00 to 5:00 p.m. at St. Paul’s Convent School. 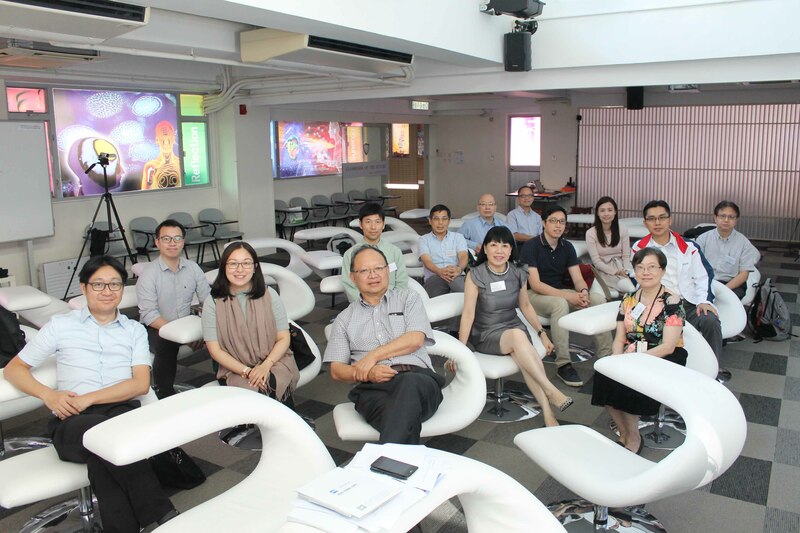 Sixteen participants, including seven teachers from TWGHs S. C. Gaw Memorial College, two teachers from HKFYG Lee Shau Kee College, one teacher from St. Paul’s Secondary School, six staff members from our school and one representative from the EDB, attended the seminar. 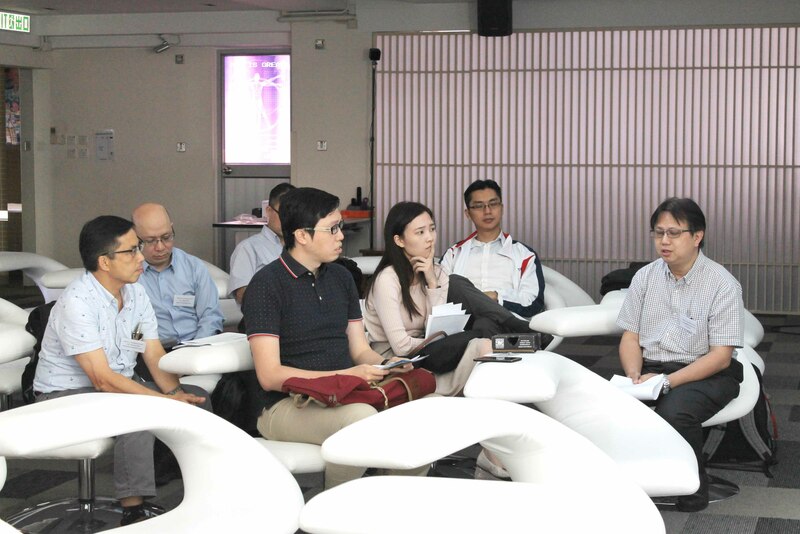 Mr. Roy Li, the panel head of Information Technology at SPCS, shared his experience of the visit to Shanghai with the group. 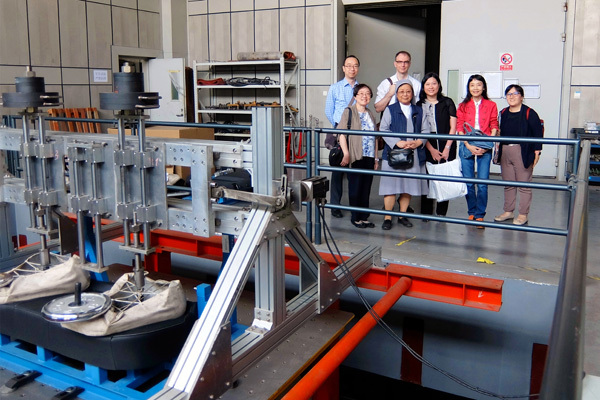 From 28th to 31st May, 2017, Sr. Margaret and 6 teachers went to Shanghai to visit various educational institutions to understand the integration and promotion of STEM in Shanghai. 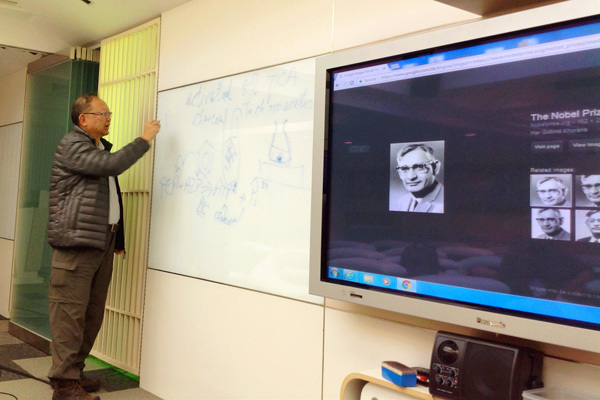 In Shanghai STEM has been identified as a significant educational concept in promoting science education and for this reason it has been well infused into various curricular locations including in the School of Software Engineering, in the School of Automotive Studies of Tong Ji University and in the museum of Shanghai Jiao Tong University. The Nord-Anglia Chinese International School has also attempted to integrate STEM into their curriculum. From contact with the masters of De Tao Master Academy, we also saw some integration and application of new ideas from STEAM into their educational and commercial projects. 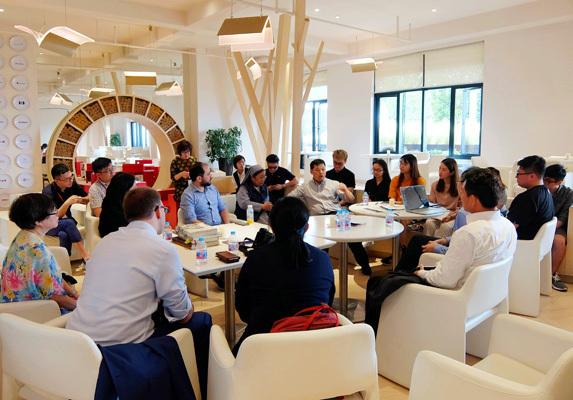 The Shanghai STEM Cloud Centre aims to build a nationwide professional platform for STEM education to serve students, teachers and schools. 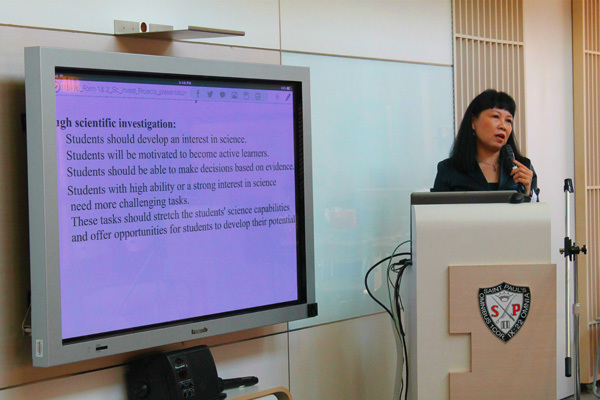 Mrs. Vivian Lo, the panel head of Integrated Science at SPCS, then gave a presentation on how various teaching strategies have been employed to raise the interest of students in learning science. 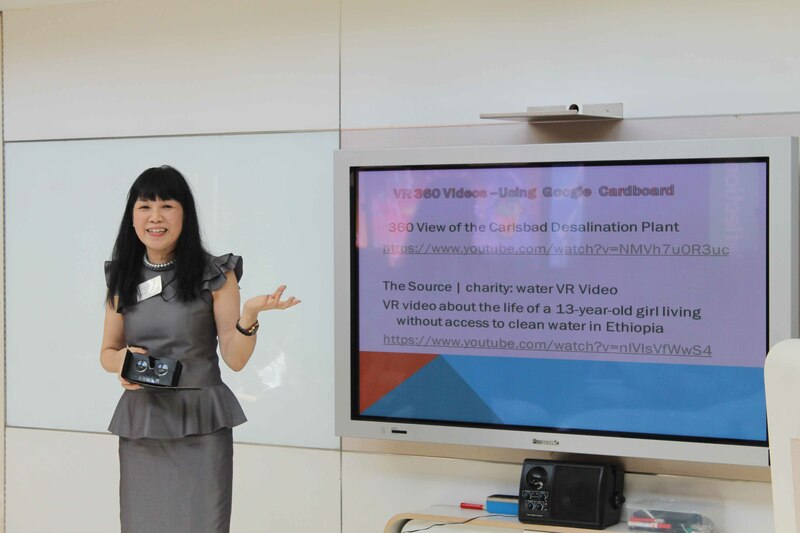 To make lessons more alive and interesting, she suggested role play, singing and use of Virtual Reality (VR) where students could immerse themselves in a simulated situation and get access to knowledge previously beyond reach. Students have been encouraged to be more observant of the real world and urged to be more pro-active in finding their own topics of interest for further scientific exploration. 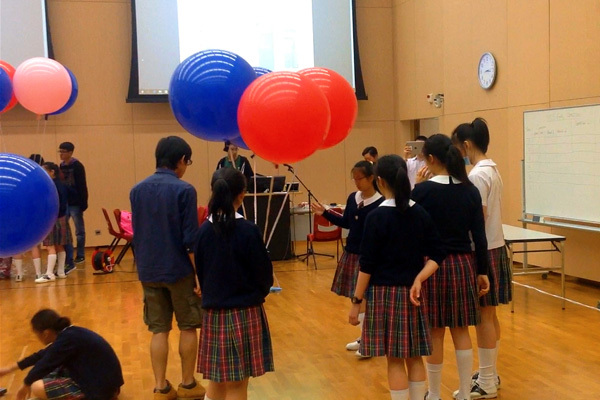 Mr. Tony Wong, the science panel head of junior forms from TWGHs S. C. Gaw Memorial College, showed how scientific explorations had become popular and appealing to his students. Training students to use simple tools, with hands-on experience, was deemed necessary for problem-solving. 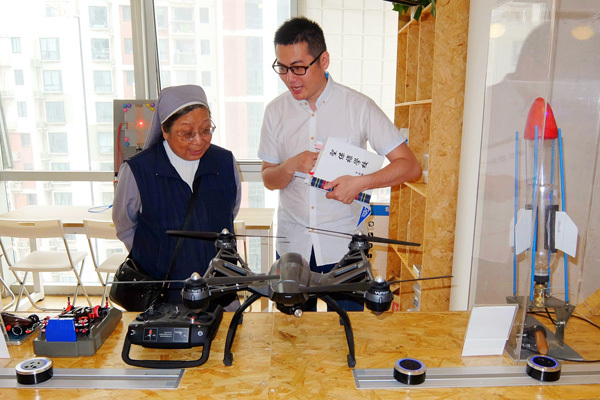 The practice of DIY and the use of more advanced technology such as 3-D printing, 360 videotaping, VR, building robots and controlling quadcopters, were instrumental in the promotion of STEM activities. Learning motivation, creativity, ability to integrate science knowledge across different subjects and teamwork spirit are all ideas specifically incorporated into the scheme of work. Mr. Leo Lam and Ms. Joey Leung, from HKFYG Lee Shau Kee College, showed how they had planned progammes for the STEM Day and how they had motivated students to be more interested in learning about science. They pointed out that, very often, cheap materials drawn from daily life could arouse student curiosity. 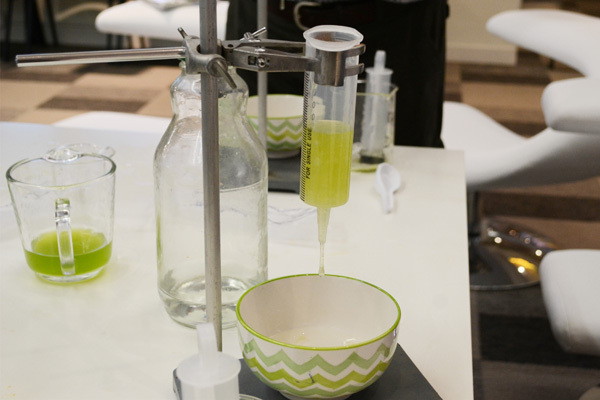 Games that are easy and enjoyable for students can also be readily adapted into experiments. Teachers also acknowledged that they encouraged trial and error procedures and that everyone, including teachers and students, were allowed to make mistakes in order to learn by elimination. Mr. Ludwig Pang from St. Paul’s Secondary School shared his experiences in guiding students in joining the Hong Kong Student Science Project Competition. 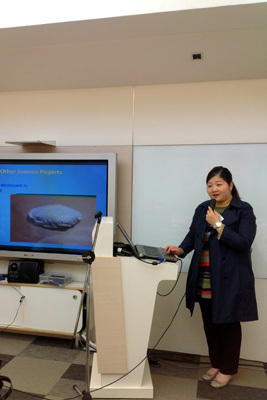 The various projects included ‘Homemade desiccant is your way out’, ‘Housewife’s friend’, ‘Immortal Fruits’, ‘How does smell affect taste?’, and ‘The sound insulation of a mushroom’. The whole idea was to create fun and drive for self-discovery in student learning. All the teachers had employed the concept of STEM education in developing the learning activities both within and outside the science curriculum. They all agreed that learning motivation was all important when it came to implementing STEM, but that they also needed manpower and resource support. They recognized that STEM had helped raise student awareness about problems in real life. STEM also enabled students to train themselves to solve problems, by encouraging them to exercise creativity, to integrate their knowledge and to finally find solutions through innovation. Overall the teachers found their new roles in STEM education to be challenging but with rewards. 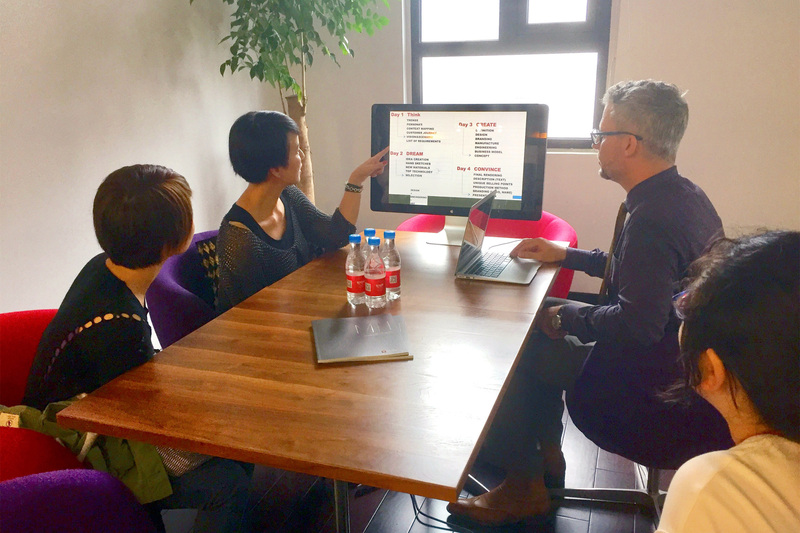 Two of our art teachers, Ms J Fok and Ms S Kim have paid a visit to De Tao Shanghai Centre of the De Tao Masters Academy in Songjiang District of Shanghai from 19th – 20th June 2017. De Tao is an organization that promotes innovation, interconnectivity and interactivity among diverse professional sectors through a unique semi-public, semi-commercial and open business approach. De Tao has recruited over 500 masters, including winners of prizes like the Oscar, Emmy, Red Dot (highest industrial design award), Compasso d'Oro, Tyler Prize for Environmental Achievement, and Humboldt Prize. The masters gather in so called 'studios' on four platforms: education and training, research and development, commercialization, and industrial investment. 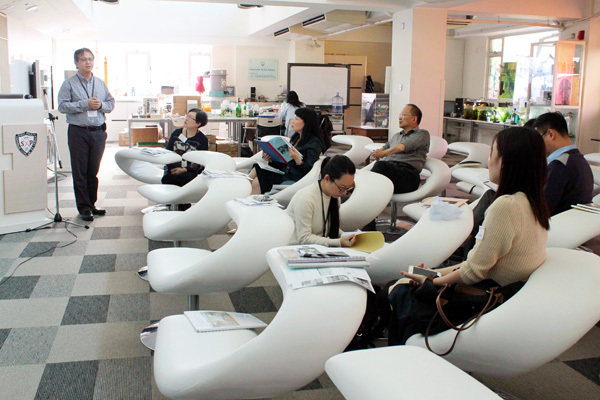 With the well organised visit plan arranged by the staffs from De Tao, the art teachers were able to visit most of the studios, workshops, and other facilities, such as library and canteen in the De Tao main building. They were very impressed by the masters’ studios as each of them is uniquely designed by the master. Masters are professional educators, designers or architects coming from all over the world. They guide the students throughout the 4 years’ undergraduate programmes and are always invited to deliver workshops or lectures in other universities in China. 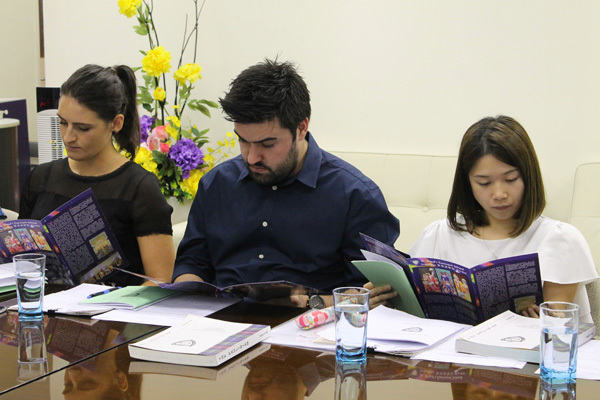 The students who studied in De Tao all look very confident and satisfied as they have the opportunities of receiving elite art and design education. The concept of setting up commercial design agencies within the design studios that can offer students with the opportunities of working in a real life setting is also innovative in the education sector. Meetings with the masters were arranged for the art teachers. They met and talked with various masters including Mr Mathis Heller of Automotive and Product Design, Mr Haim Dotan of Ecological Architecture Design, Mr Roy Ascott of Technoetic Arts, and Mr Patrick Gottelier of Fashion, Knitwear, Sportswear Design. 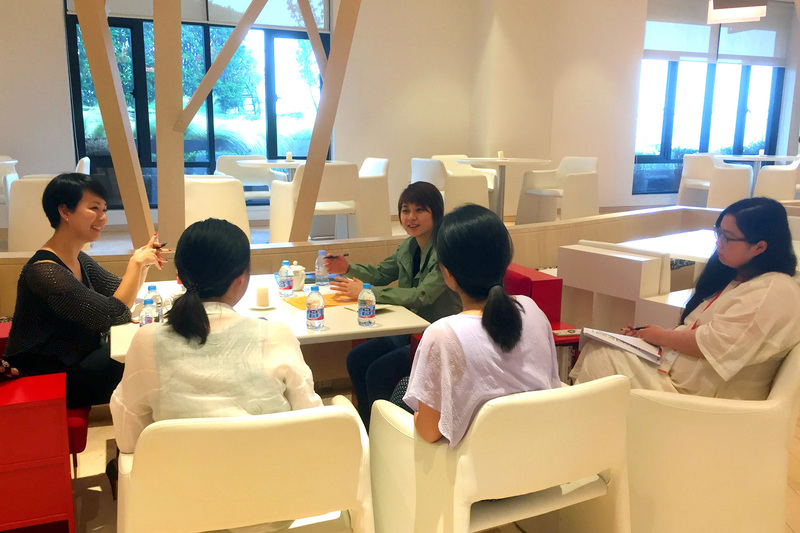 They were introduced to the masters’ products and architectural design, the 21st century teaching methodologies and the potential of applying technology in art and design. Apart from meeting with the Masters, the art teachers also talked to a team of animation students who are about to graduate this month. 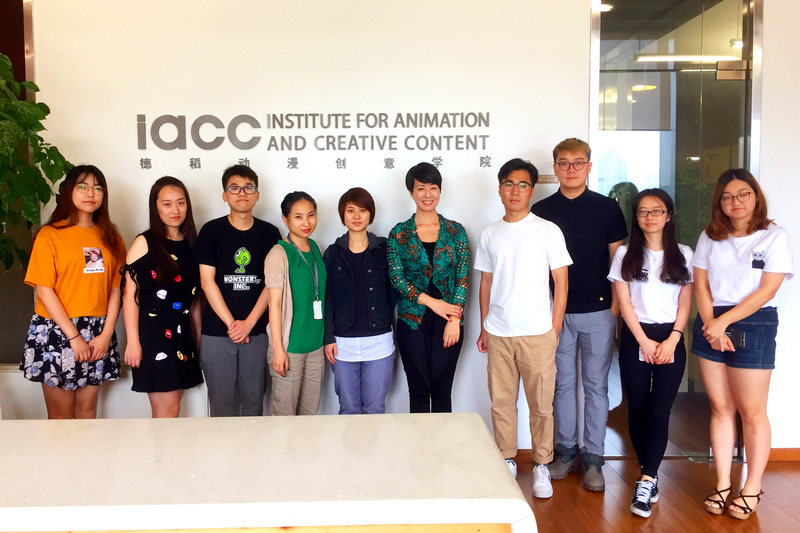 The students presented the concept and character designs of their final animation project, and explained how the interactions with the masters help them to improve and excel. Finally they have watched an award winning original short animation produced by one of the teams. 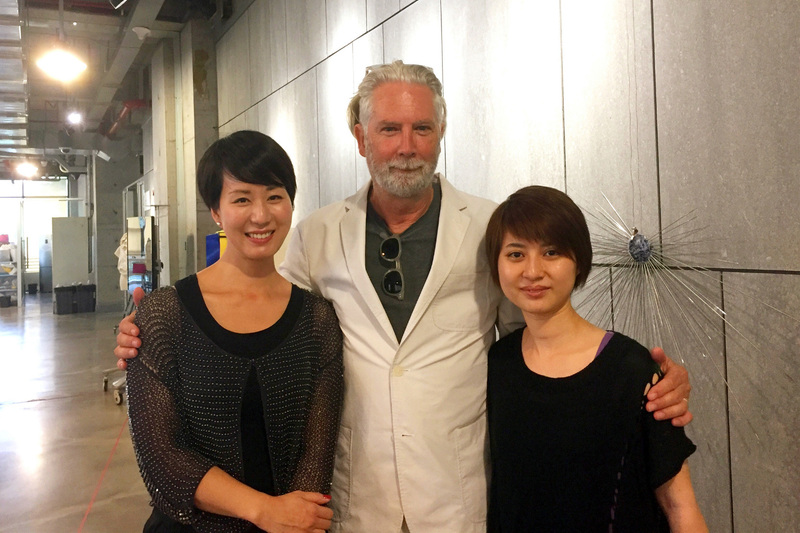 Besides visiting De Tao Shanghai Centre, the art teachers also paid visits to various art spaces, such as the M50 Moganshan Road which is a contemporary art district in Shanghai. They visited several art exhibitions and were immersed in the art atmosphere of the area. 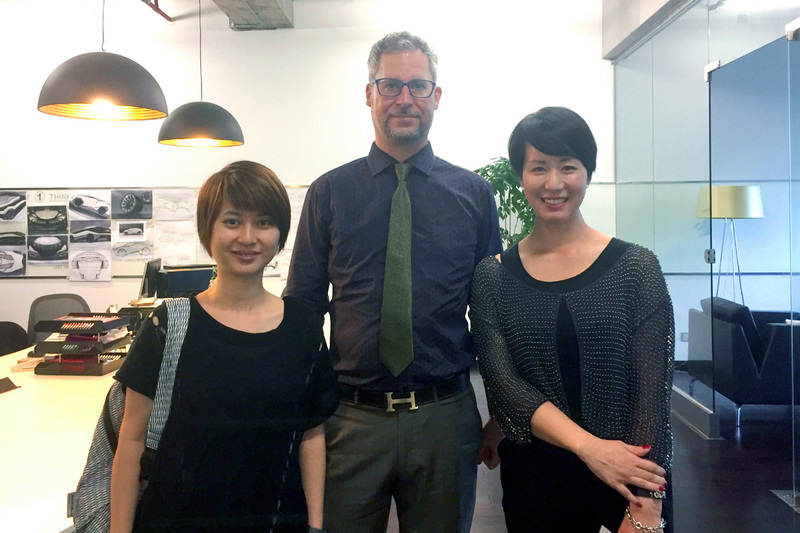 Through the visit in De Tao, the art teachers understand more about the latest development of art and design education in China. 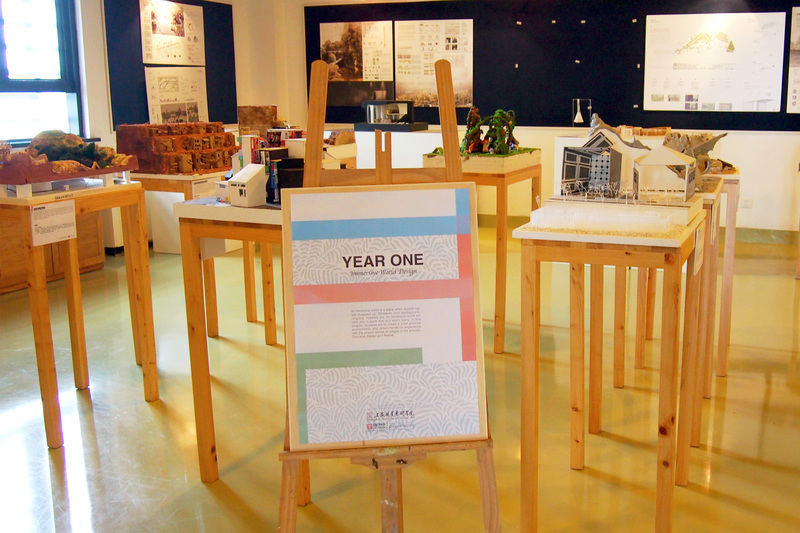 They were also inspired by the multi-disciplinary project plans and outcomes of some project-based short courses designed by each studio and the concept of integrating the creative industries with education. The teachers valued the experience of this visit very much and will certainly look at the potential areas for development in the future. 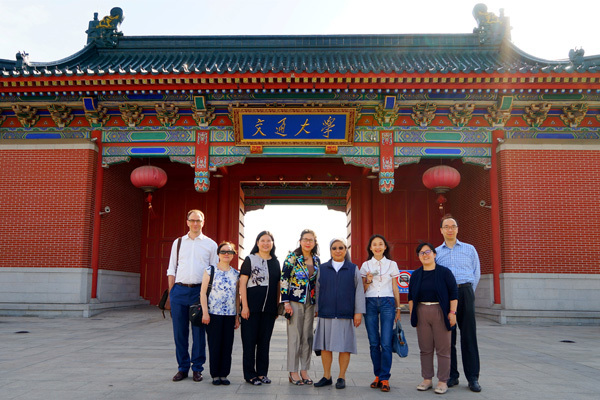 On 28 – 31 May 2017, Sr. Margaret and 6 teachers went to Shanghai to visit various educational institutions to understand the integration and promotion of STEM in China’s largest city. STEM has been identified as a significant educational concept in promoting scientific education and the focus on applying the ideas into the various curriculum was obvious across all the locations which we visited. 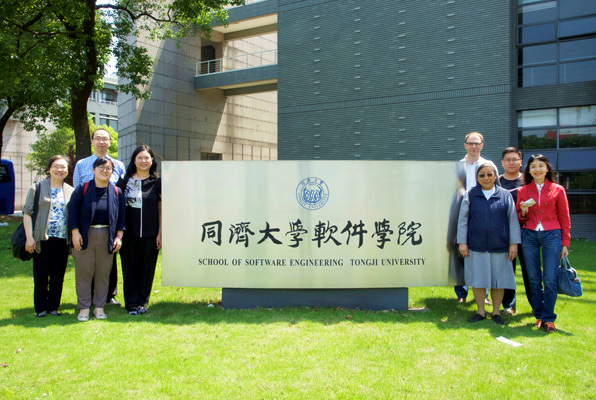 We were very fortunate to have been given the opportunity to visit Shanghai Tong Ji University, where we toured the School of Software Engineering as well as the School of Automotive Studies. Graduate studies from the School of Engineering demonstrated to us how they were able to speed up rendering times of 3D objects using OpenGL, and the projects they had been working on in conjunction with various companies to make smooth 3D tours of new buildings. 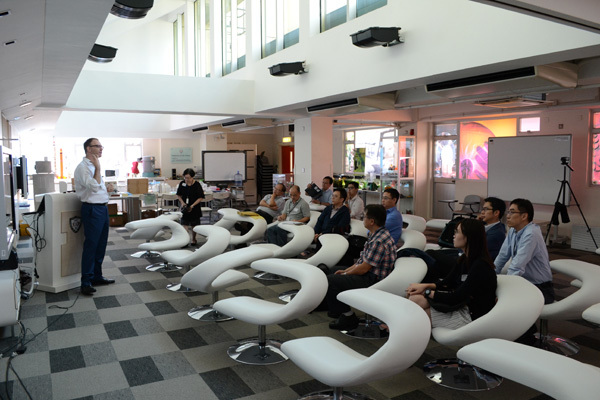 Mr. Fang Liang took us to visit the advanced testing facilities and laboratories, at the School of Automotive Studies. 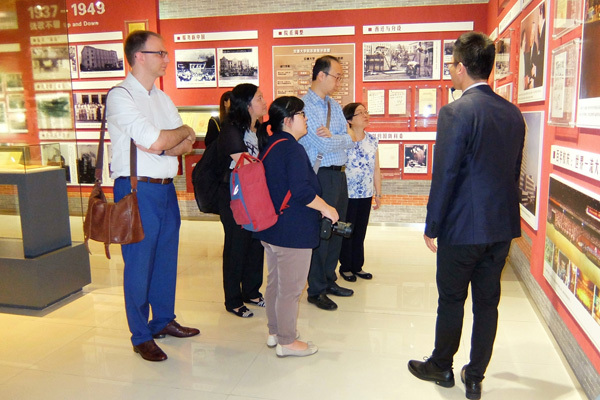 We also visited Shanghai Jiao Tong University, where a tour of the university’s museum showed a clear history of innovative research in science and engineering. 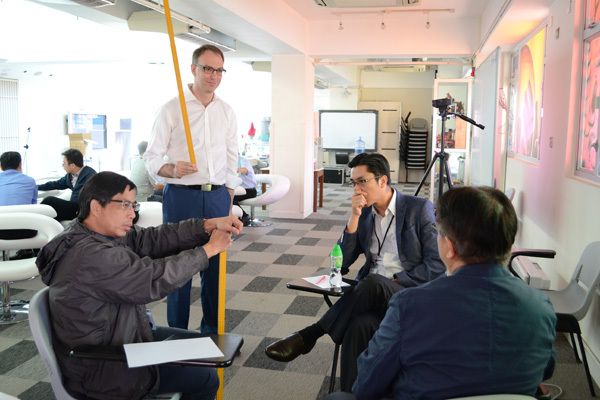 We were awe struck by the alumni and professors of the university, as they had worked on pioneering projects such as the first Chinese made commercial airplane. 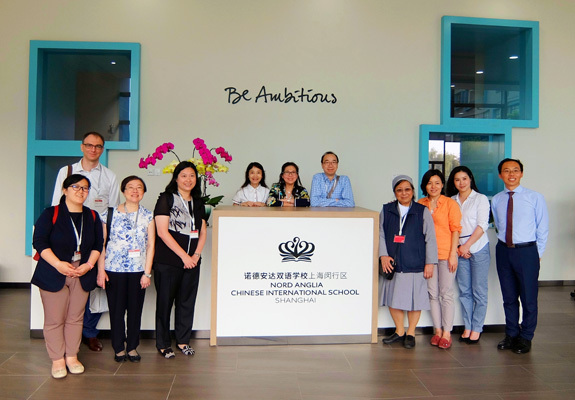 SPCS was invited by Principal Gu Wenxiu to visit the Nord Anglia Chinese International School, Minhang District. Nord Anglia caters to students from age 6 to 18 years. It follows blend of core elements of the Shanghai National Curriculum with other international teaching methods and philosophy taught through the medium of Putonghua and English. We were given a tour of the extensive modern campus as well as participate in exchange of ideas about bilingual education and integration of STEM across different curriculum. 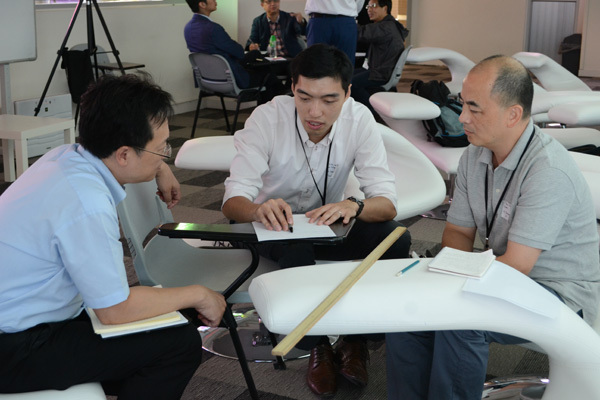 The dialogues about how each school aims to overcome the various challenges when integrating STEM principles helped to stimulate new ideas for both schools in the future. We look forward to further exchange opportunities between teachers and students of the school. The visit to DeTao Master Academy was an eye-opening experience where we were able to meet various masters, such as Patrick Gottelier (fashion design), Jane Gottelier (fashion design), Matias Del Campo (architect), Fernando Brandao (architect) and their teams as they worked on various educational and commercial projects in their studios at the academy. Their studios were extremely inspiring work and learning spaces, with many great ideas that can be used for creating motivating and functional educational spaces for students back at SPCS. It was also interesting to learn how they infused their own philosophy into the way they designed their various courses. 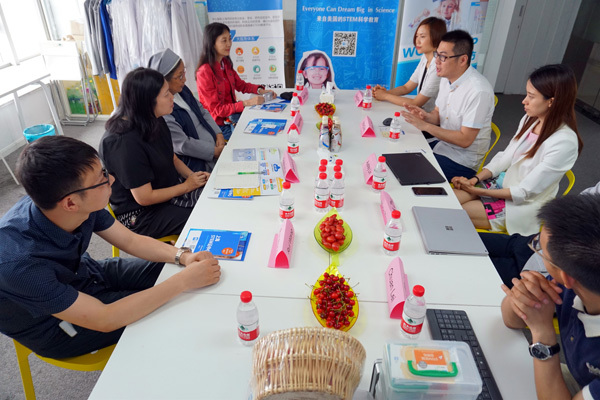 We also visited the Shanghai STEM Cloud Centre on 31st May 2017 to showcase their success on delivering STEM education to students, teachers and schools in various provinces in China. According the Dr. Zhong Yizhong, the director of the Centre, Shanghai STEM Cloud Centre aims to build a professional platform for STEM Education, concentrating on fostering innovation ability of young talents and ability of applying interdisciplinary knowledge into practice. 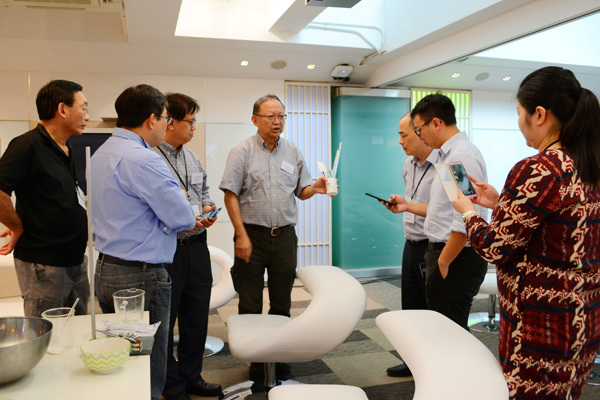 After thorough discussion with the staff from the Centre, we explored the collaboration opportunities between SPCS and Shanghai STEM Cloud Centre. 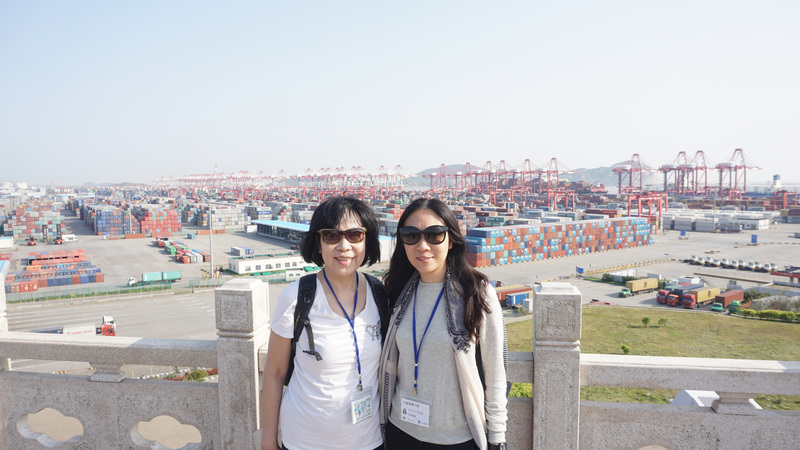 Our Liberal Studies teachers, Ms. R. Luk and Mrs. C. Cheng joined the “COSCO Shipping and Logistics Tour” from 14th April to 18th April, 2017 co- organized by Endeavour Education Centre Ltd and China COSCO Shipping Corporation Limited, visiting major ports in China, including Shanghai and Ningbo. 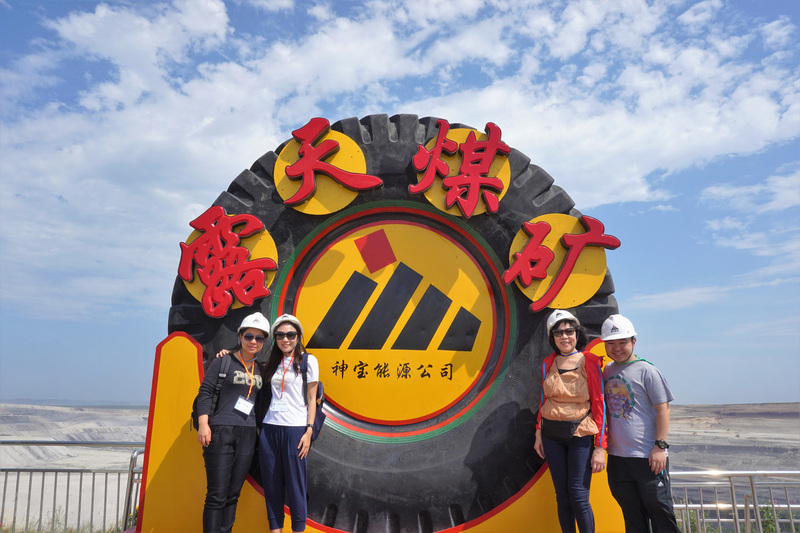 The stimulating tour enabled them to witness the current logistics development in China and the asset investment projects along the Belt and Road”. 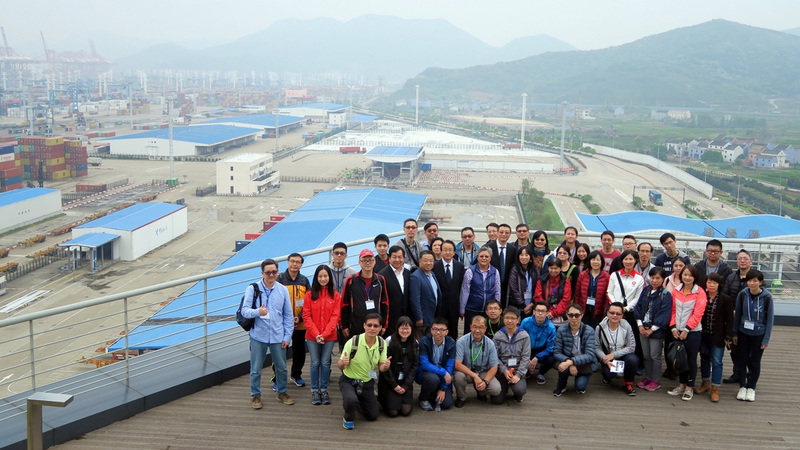 They had the valuable opportunities to visit the major port infrastructures and facilities along the 21st Century Maritime Silk Road including the developed Yangshan Port and Ningbo Port, the Nantung Kawasaki Shipyard and the Shanghai Maritime University. 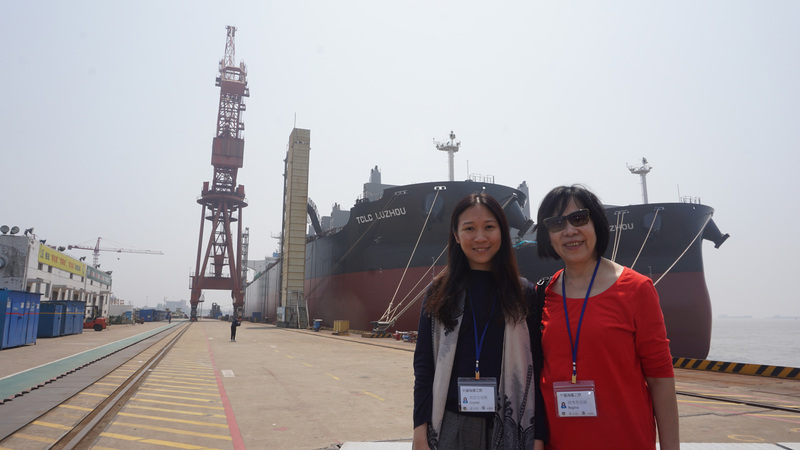 The teachers also had the rare opportunity to tour inside one of the world biggest container ships and converse with the frontline elites working in the industry. There were also panel meetings to discuss the latest development of and the role of Hong Kong in the “Belt and Road Initiatives”. 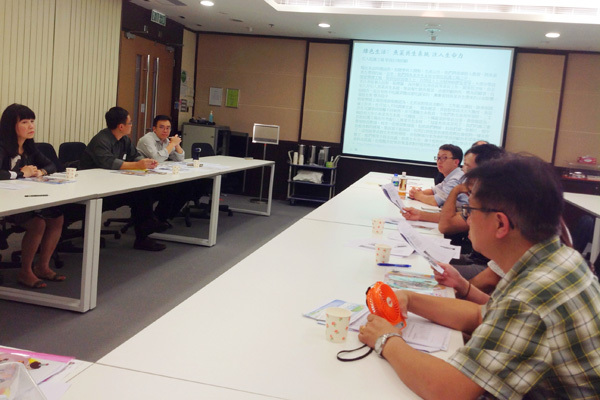 The visits and panel meetings allow the teachers to understand the latest progress of a globalizing Chinese economy, the consolidation of advantageous resources and the development of global shipping, integrated logistics, and shipping industry in the world. 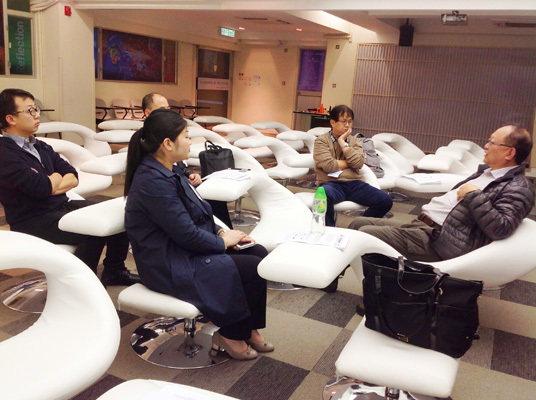 The PDS Seminar 6 “Taster of the Airship Program” was held from 2-6pm on Wednesday, 5th April, 2017, at the Hong Kong University of Science and Technology. 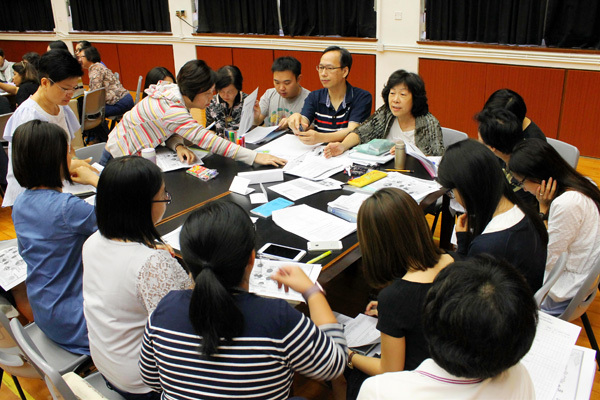 Thirteen participants took part in the seminar including two teachers from TWGHs S.C.Gaw Memorial College, two teachers from St. Paul’s Secondary School, one teacher from HKFYG Lee Shau Kee College, three staff members from Hong Kong University of Science and Technology, one representative from the EDB and four staff members from St. Paul’s Convent School. 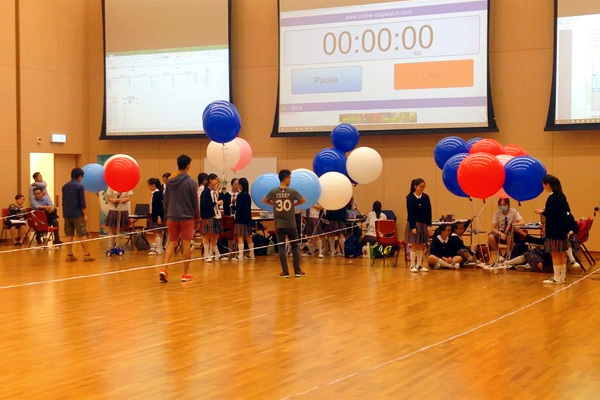 The students, divided into teams, were observed in their final stages of making and testing airships and they were asked questions about the length of the training they had received from the HKUST professor and student helpers. After one hour of test and trial the competition began. 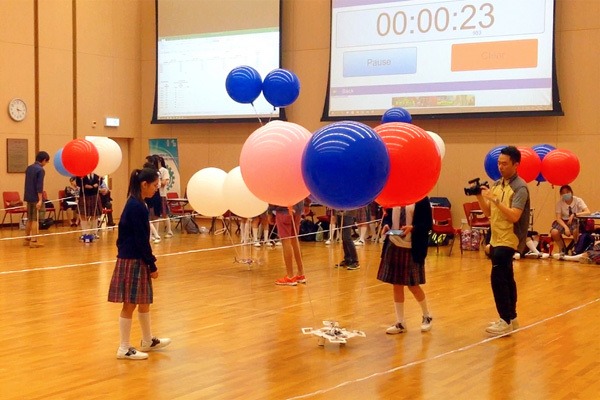 The whole event went smoothly and it was encouraging to see students learning through teamwork, mastered the skills of problem solving, and developing their sense of creativity in their airship designs. In a plenary session all the seminar participants noted how impressed they had been by the event and how they were already thinking about organising similar ‘alternative learning opportunities’ to bring fun and joy into the learning process at their schools. The professor from HKUST made an interesting observation that some students with special learning needs actually outperformed the other students in the problem-solving part of the game competitions. Everyone agreed that they would continue to develop initiatives that enhanced student interest in scientific exploration. 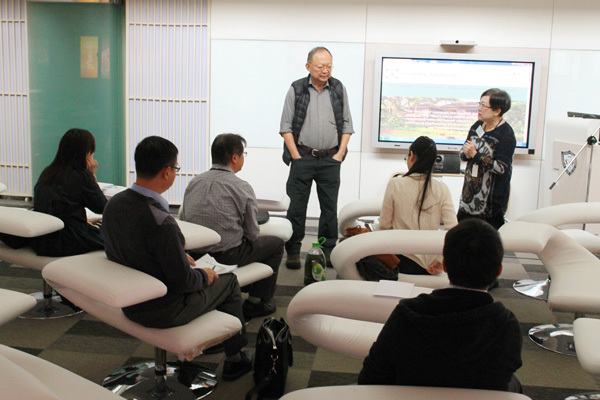 They saw the importance of mutual support, and greatly valued the free opportunities for training and resource sharing offered by the HKUST professors for the promotion of STEM education in local schools. Teachers from our partner schools also recognized how Paulinian students benefitted enormously from the Wednesday afternoon Diversified Interest Program and the valuable opportunities it opened up in terms of creating the right environment for school-university collaboration. The PDS Seminar 5 was held on Thursday, 9th March 2017, from 4:30 to 6:00 p.m., at St. Paul’s Convent School. 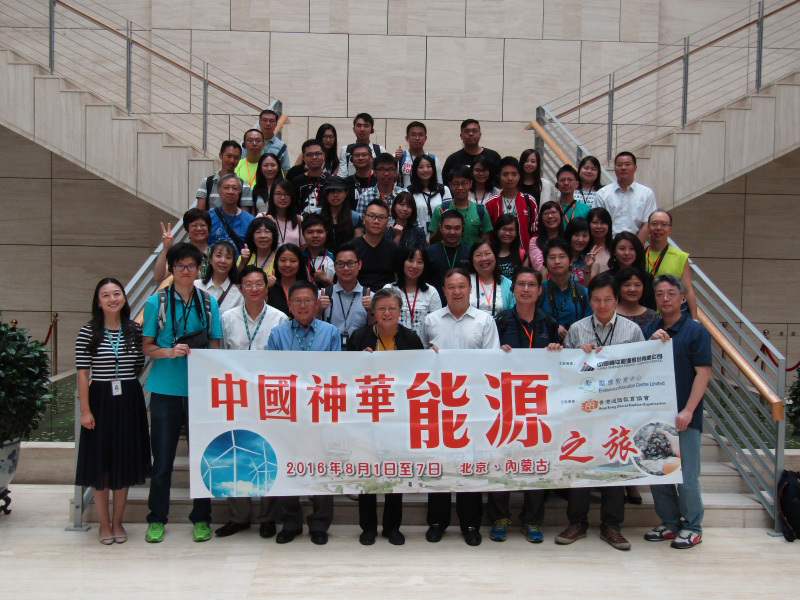 It was based on the title “Use of Active Charcoal and Sharing of School-based Project Designs”. 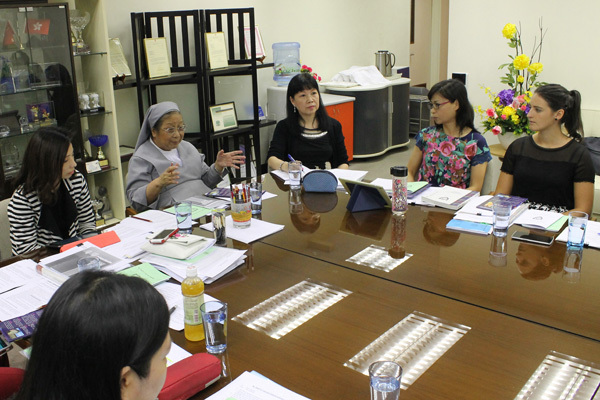 Six participants, including one teacher from TWGHs S.C.Gaw Memorial College, three teachers from St. Paul’s Secondary School, and two staff members from St. Paul’s Convent School, attended the seminar. 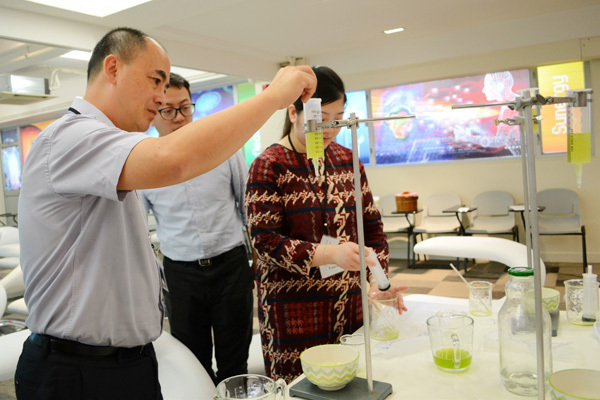 Dr. Albert Cheung, our scientist-in-residence, demonstrated using organic food (Glocono delta- lactone), instead of an artificial chemical, to help with coagulation when making Tofu dessert. It is supposed to be a healthier way of cooking. The idea was to promote the awareness of having a healthy lifestyle with the support of scientific knowledge. Dr. Albert Cheung, the scientist-in-residence at St. Paul’s Convent School, gave a presentation on the use of active charcoal in scientific investigations and its potential for green education. He then suggested some ways in which teachers could plan different experiments, for different year groups of students, using the charcoal. Lastly, Dr. Cheung showed the application of using the EPDM membranes (a type of high efficiency filter) in the setting up of an apparatus for the making of compost, an organic fertilizer made from food waste. Each partner school took two pieces of these membranes back to their own school so that they could designs their own apparatus for experiments. 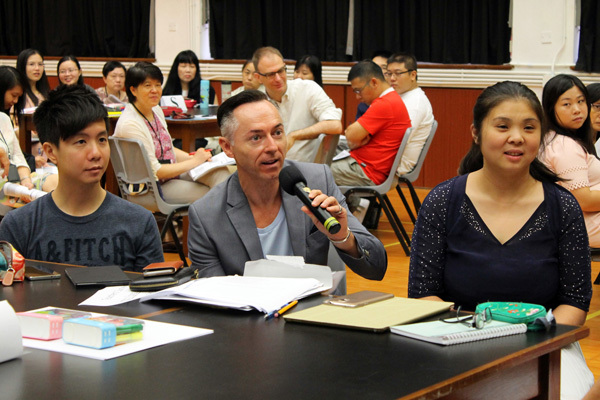 Mr. Tony Wong, the science Panel Head of junior forms from TWGHs S.C.Gaw Memorial College, outlined how he applies theories to practice in Integrated Science, helping students to learn in a fun way via group competitions. For example, his project ‘Angry Bird’, though simple, had aroused great excitement in his Secondary One students. Students studied the topic of ‘potential energy’, and then used materials such as wooden sticks and rubber bands to construct catapults. Creativity was encouraged by the design process and, as the students became more interested in the topic, they demonstrated ownership of the project and cooperation skills. 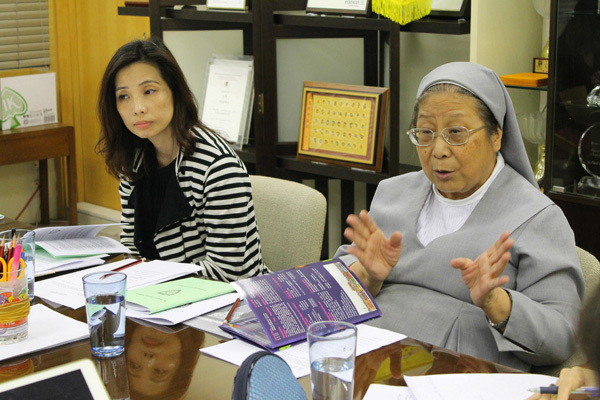 Ms. Shirley Shea, the Panel Head of Integrated Science at St. Paul’s Secondary School, outlined her work revising the current subject curriculum and in leading students in project learning and competitions. Topics under investigation included DNA fingerprinting, making an origami DNA model and DNA extraction from strawberries and kiwi fruit. 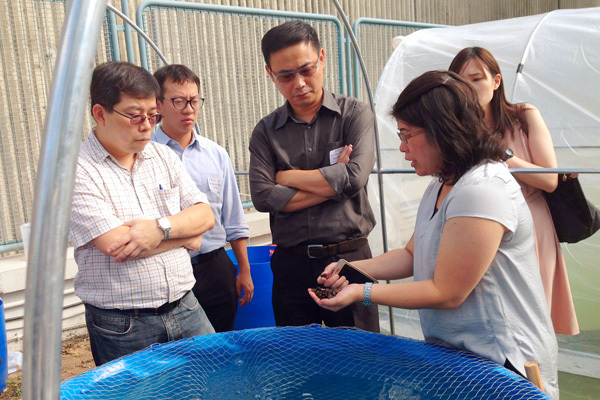 Mr. Ludwig Pang, from St. Paul’s Secondary School, explained how he guided students in their investigations into aquaponics, pollutants and algae. Students and teachers from his school have been actively engaged in scientific explorations this year and more than ten teams from the school were involved in outside scientific competitions. All the teachers then discussed how they motivated and supported those students who wished to develop their interest in scientific explorations beyond formal lessons. Despite very tight schedules, teachers and students were making use of recess and after-school time for scientific activities. It was encouraging to see that student creativity, commitment and competence, regardless of student ability, were considerably enhanced when opportunities were given. Everyone recognized that STEM education has benefitted both teachers and students. The PDS Seminar 4 on “Wonders of Algae & Experiment in Molecular Gastronomy” was held on Thursday, 5th January 2017, from 2:00 to 4:00 p.m. at St. Paul’s Convent School. Eight participants, including 3 teachers from TWGHs S. C. Gaw Memorial College, 3 teachers from St. Paul’s Secondary School and 2 staff members from our school, attended the seminar. He then gave a presentation on the wonders of algae as a potential source of food and energy. As a single cell organism, it can multiply fast and undergo photosynthesis. It can also act as a bio-filter absorbing pollutants such as CO2, VOCs and odor from the environment, hence producing oxygen, clean air and water. An experiment to make algae beads was demonstrated and participants were given the opportunity to do the experiment, so that they could teach students at their school. 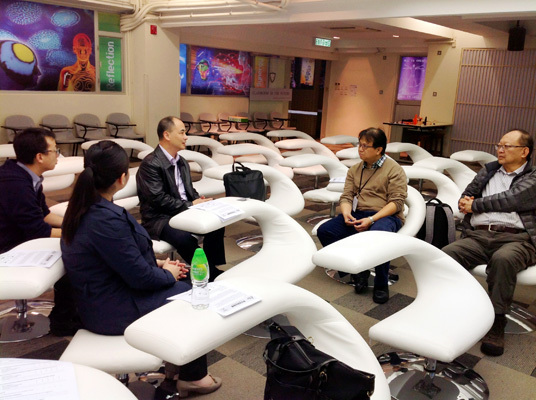 All in all, this seminar was an eye-opening experience for participants. It is to be hoped that they will take on board the new ideas and do their own further investigations for the promotion of green living. The PDS Seminar 3 on “Designs for Experiments in Scientific Investigations” was held on Wednesday, 7th December 2016, from 2:30 to 5:00 p.m. at St. Paul’s Convent School. 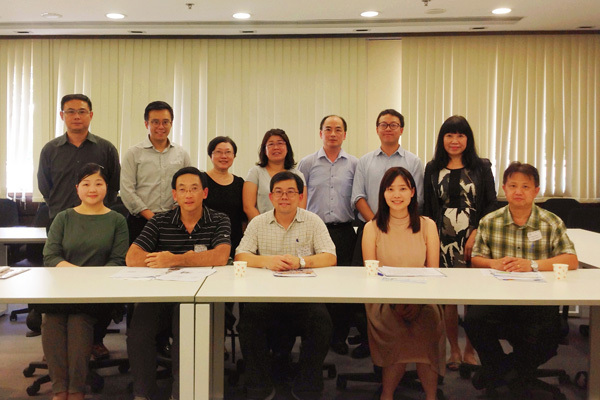 Ten participants, including two teachers from TWGHs S. C. Gaw Memorial College, one teacher from HKFYG Lee Shau Kee College, one teacher from St. Paul’s Secondary School, five staff members from our school and one representative from the EDB, attended the seminar. 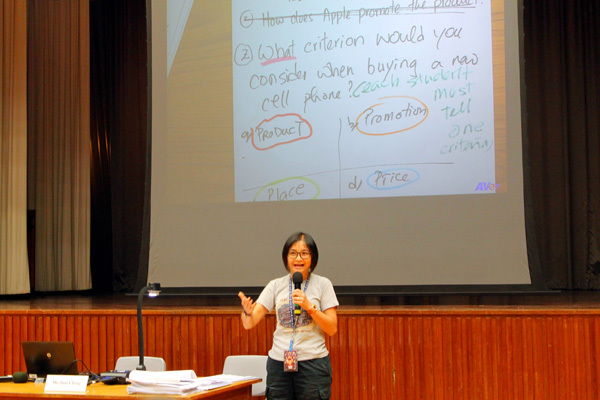 Mrs. Vivian Lo, the panel head of Integrated Science at SPCS, gave a presentation on how SPCS teachers had already tried out some new ideas for scientific investigation. She went on to explain how students could further develop their potential through investigative project learning. 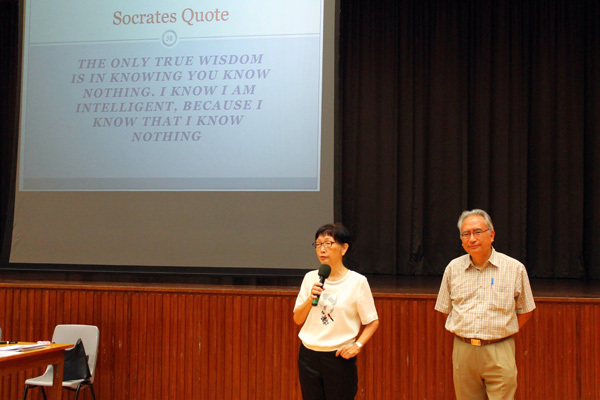 Mr. Tony Wong, the science panel head of junior forms from TWGHs S. C. Gaw Memorial College, outlined how his school’s science curriculum had been thoroughly revised and how it had made scientific exploration more fun for all students. By using up-to-date instruments and apparatus, by adopting newly designed experiments or by adapting modified experiments from websites and YouTube, his school had boosted the subject’s popularity amongst the student body. Ms. Florence Fung, the panel head of Integrated Science from HKFYG Lee Shau Kee College showed her very unique way of combining online classroom teaching, reading, adapting textbook materials and doing experiments in regular science lessons. Such approach had proved to be an effective teaching method as her students had shown a marked overall improvement in their performance. Mr. Ludwig Pang from St. Paul’s Secondary School shared his experiences in guiding students in project-based studies in aquaponics, diaphonization and measuring voltage in chlorella. 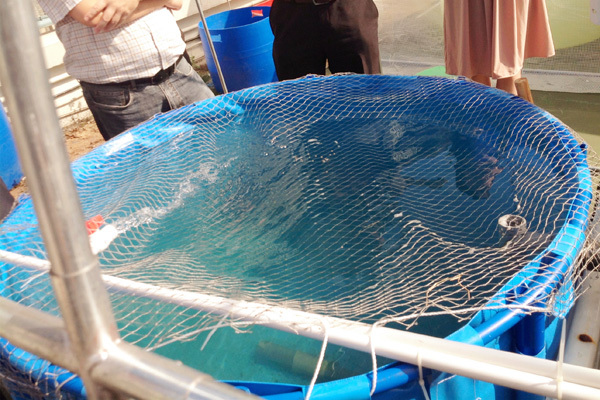 Subsequently, student teams had successfully undertaken a number of independent studies, from constructing the aquaponics system to making their own electric submergible motors. 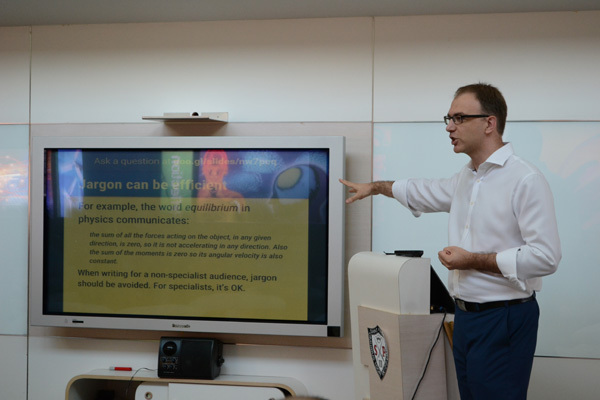 From all the presentations, the teachers concluded that a bespoke school-based curriculum, perhaps involving STEM, could be effective in meeting the unique needs of individual schools. In addition, students could find science an interesting and creative subject which they could continue to explore beyond the classroom. The combination of online teaching, use of text book materials and doing experimentation is the way forward when it comes to interesting and engaging all students. The PDS Seminar 2 on “How to Improve Students’ Technical Writing Skills” was held on Monday, 31st October, 2016, from 2:30 - 4:15 p.m. at St. Paul’s Convent School. 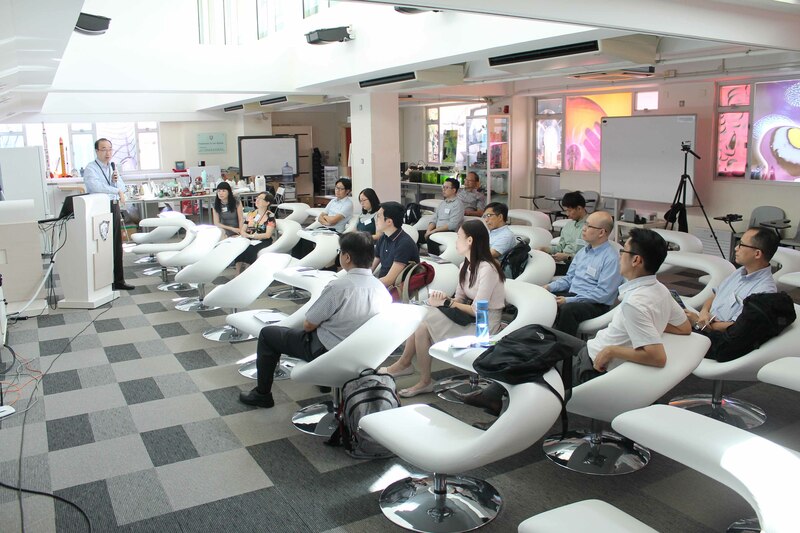 Thirteen participants attended the seminar, five teachers from TWGHs S.C. Gaw Memorial College, one teacher from St. Paul’s Secondary School, one teacher from HKGYG Lee Shau Kee College, two representatives from the EDB and four staff members from our school. Mr. Peter Blythe of SPCS gave a systematic presentation on the importance of clarity and accuracy as the basic elements of a good scientific report. He introduced the various parts that make up a scientific report and gave examples of sentences and phrases that could be useful when writing about equipment, materials, procedures, results etc. He pointed out that students often confuse the ‘results’ part of a report with the ‘interpretation’ part. To avoid this problem, he suggested that students should be reminded to keep their ‘observations’ separate from their ‘interpretation’. Regarding analysis and discussion, he suggested that students should be able to distinguish between causality and correlation, and should always be able to identify areas of uncertainty. Only when made aware of the uncertainties in their conclusions would they be in a position to think of ways to reduce the influence of the uncertainties on their results. Teachers were then asked to do an exercise in groups. They raised questions in the process and this led them to reflect further on their teaching plans and their design of future scientific experiments for their students. 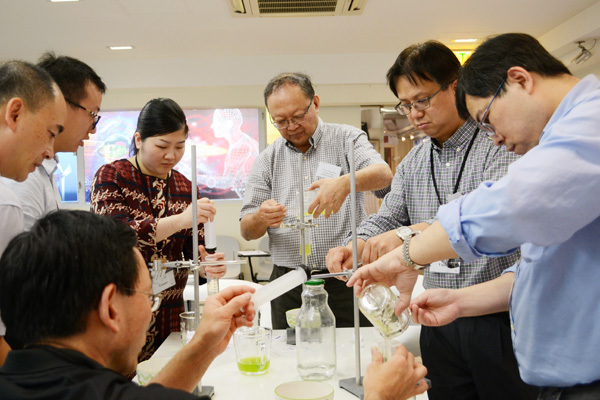 The PDS (Professional Development Schools Scheme) Seminar 1 on ‘Using STEM in Setting Up the Aquaponics System’ was held on Thursday, 27th October, 2016, from 2:00 - 4:15 p.m. at the IVE (the Institute for Vocational Education), Shatin, NT. Thirteen participants attended the seminar, 5 teachers from TWGHs S.C. Gaw Memorial College, 3 teachers from St. Paul’s Secondary School, 2 members from the EDB and 3 staff members from our school. Ms. Carmen Wong, a lecturer from IVE, spoke on the operation of the aquaponics system in the IVE and its possible uses in educational projects for students of different levels of attainment. The design of the ‘Constant Height One Pump’ (CHOP) system, the theory behind it, and the practical aspects of its set-up and running costs were introduced. The educational value of using the aquaponics systems in STEM learning at different levels was then opened for discussion. A study package has been developed to facilitate teaching and learning using aquaponics, and this promotes life education, garden therapy, green education and is a pilot for the commercialization of production. The aquaponics system has proved to be a good learning tool as it provides students with a broad base on which they can apply and integrate their knowledge of various subjects, including Chemistry, Biology, Physics, Geography, Mathematics, Agriculture & Fisheries, Engineering and Technological Design. A site visit to the ‘Ecocube’ in the garden of the IVE followed. At the site, participants observed operations, and practical issues and problem-solving techniques were discussed. Overall, the seminar provided everyone with an opportunity to witness how the aquaponics system survives and sustains itself when exposed to environmental factors like climate change, wind, sunshine, insect control, soil and use of organic fertilizers. On Monday, 29 August, 2016, Ms. Jane Cheng, ex-Principal Education officer for Quality Assurance and Inspection for the EDB, conducted a Staff Development session for all the staff of SPCS. With an External Review coming up for SPCS in the 2016-17 year it was seen to be vital to have a ‘critical friend’ in the school to help teachers fine-tune their work before the EDB inspectors arrive. The 3.5 hour session was both informative and interesting. Teachers were reminded of the relevance of the updated Bloom’s taxonomy of learning and they were also shown the benefits of enabling students to develop more personal autonomy in their learning. This, Ms Cheng explained, could be done by encouraging students to actively engage in feedback sessions, by the teacher building up scaffolding to enable students to become more creative when constructing their own ideas, and by the teacher not only using high-level questioning skills themselves but by actively promoting these skills in their student learners. Ms. Cheng ended by wishing everyone well in their upcoming Review and received a warm round of applause for her efforts. 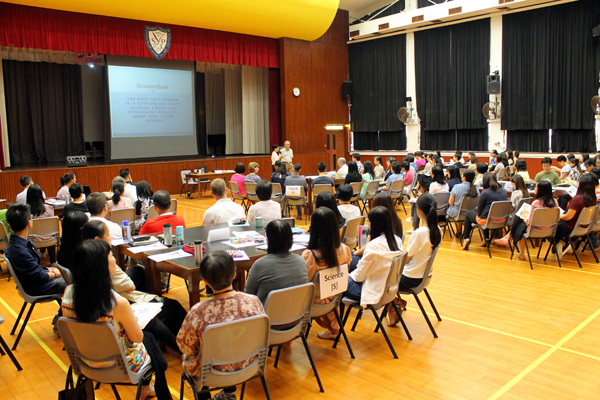 On 25th of August, 2016, all the new SPCS teachers were invited to attend an Induction meeting in the school hall. 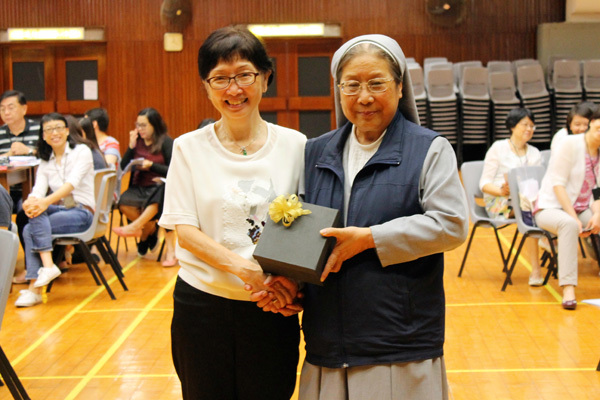 Principal Sister Margaret Wong, the Induction team and the new teachers all introduced themselves to one another in a most convivial atmosphere. Sr. Margaret then gave an overall description of the school, including its nature, mission, vision, and history, and she also explained the school badge and motto. Mrs. V. Lo followed up on this by introducing the professional guidelines for teachers and these included the rules of attendance and dress code. Student discipline and attendance systems, and rewards and punishment procedures, were outlined by Mrs. A. M. Law, and Mrs. L. Lam then presented the updated school curriculum. Guidelines were also given out on assessment obligations, copyright laws, gifts and presents rules, teachers’ log book requirements, homework and assignment policies and peer lesson observation arrangements. Extra-curricular activities were introduced by Mrs. J. Wong. She went over the proper procedures for conducting activities inside and outside school, and presented the various forms that need to be filled-in before an activity takes place. Safety is a priority issue at SPCS and Mrs. L. Ko explained the guidelines on how to handle accidents, contingency plans in case of bad weather, and fire drill routines. Mrs. 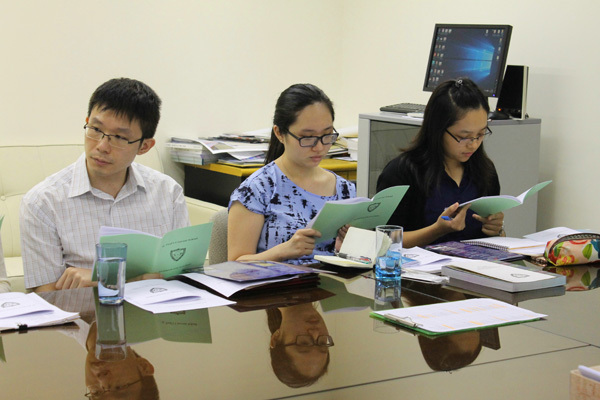 I. Wu introduced the SPCS fee remission and scholarship scheme, and Ms. M. Kwok talked about library support and rules. Last but not least, all the new teachers were informed that there are a lot of support systems in SPCS to help them adjust to their new environment. They were urged to not hesitate to seek help, if they encountered any problems throughout the year, from their own personal teacher mentor, their teaching colleagues and from any of the school administrators. 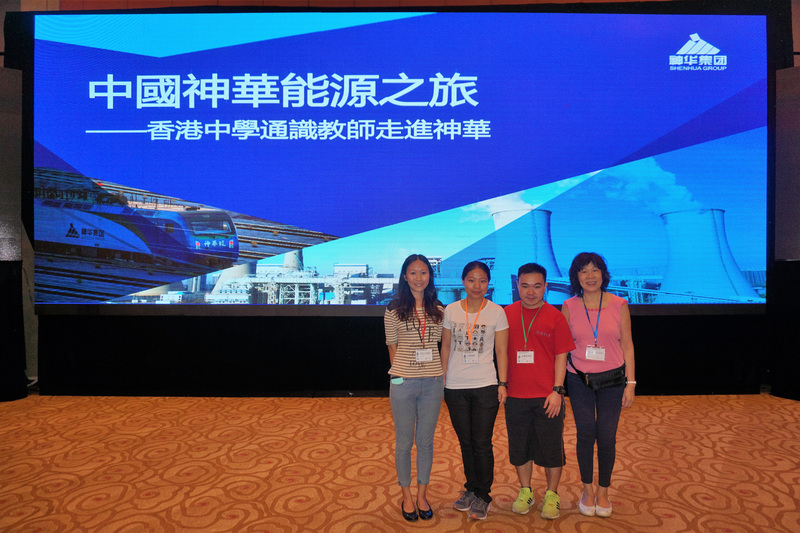 4 of our Liberal Studies teachers joined the “Shenhua Energy tour” co- organized by Endeavour Education Centre Ltd and China Shenhua group, a state-owned enterprise, from 1st August to 7th August, 2016. 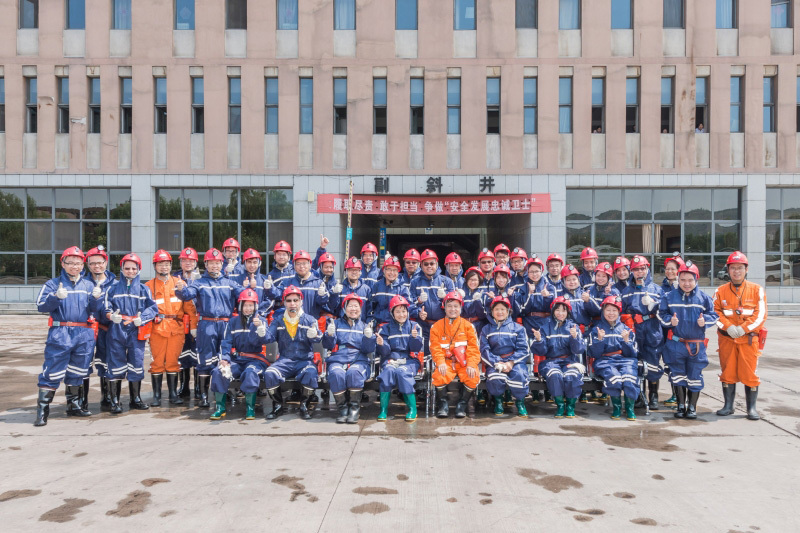 They had the valuable opportunities to witness the energy technology development in China and visited environmental friendly coal mining and power generation facilities, wind power site, liquefied coal plant and the National Institute of Clean-and-Low-Carbon Energy in Beijing and Inner Mongolia. The teachers also had the rare opportunity to visit the underground coal mine and exposed to the latest clean coal mining technology. 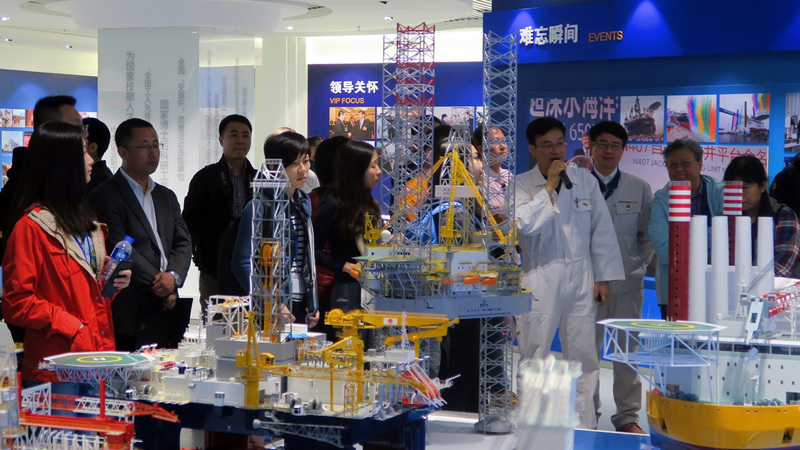 The visits and panel meetings provided them with the latest info on the implementation of China’s energy policies and the cutting-edge technological development to ensure sustainable energy development in the world. 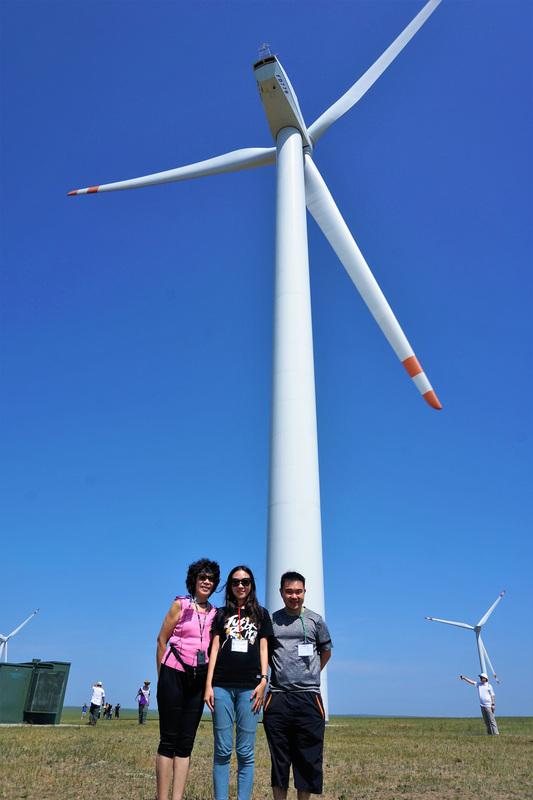 The trip has been a fruitful staff development experience and an eye-opening exposure to the energy technology development in the world.